Hi folks I'm new to the group and an experimenting macro beginner. My camera is a Canon 60D. For the asian beetle shot I was using a 100mm f/2.8 lens mounted on a tripod. 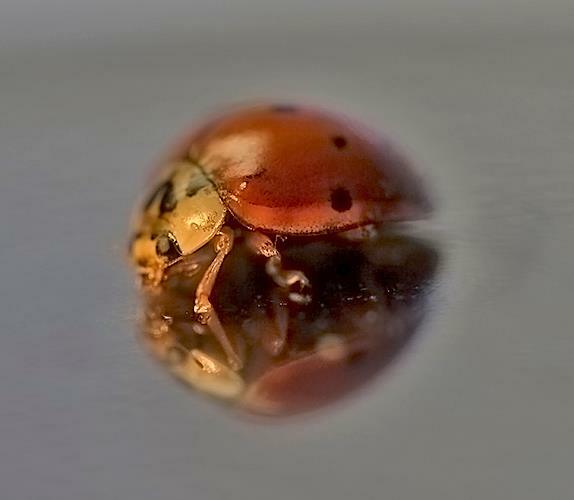 I placed the asian beetle on a chrome cup lid to try to capture it's reflection especially it's underbelly. I tried several shots aimed at the eye. The results are a bit confusing. Why does the beetle appear a have a blurred outer halo look. The shot was on a timer. 1. I have lightly edited your post, to add a couple of newlines between "mark" and the image. This lets the post lay out neatly from top to bottom. Without the newlines, "mark" appeared far separated from "Thanks! ", aligned with the bottom of the image. 2. When posting, notice that there's a Preview button that will show how your post will look when viewed. That's a very handy thing to use, especially since there are some common errors that can cause formatting to get very strange! 3. Posting into the "Archives" forum was not ideal. The Archives forum is really intended to hold old posts, from 2008 and earlier except for a few that have been bumped by more recent Replies. A better place would have been in "Beginners Macro" or possibly "Technical and Studio Photography -- Macro and Close-up". I can move the post to Beginners after you've had a chance to reply here so that I know you've seen my comments. Overall this is a very promising start! I like the composition, and it looks like you've nailed focus on the eye. I see a couple of different effects that you might be describing as "blurred outer halo look". First is that, directly above and below the beetle, especially below, there is a relatively narrow halo (about 10 pixels wide in the image as posted) whose color is a mix of the beetle and the cup lid. The one at the top looks like normal OOF appearance, with the edge of the beetle also OOF. The one at the bottom is unusual in that the shoulder of the beetle appears well focused but still there is the blurred halo. I'm guessing that one is due to some microtexture in the cup lid, sort of like tiny ripples in water can cause a softened reflection while nearby smooth water is giving a clear one. The other and more puzzling halo is the wider area, about 25 pixels, around the right side of the beetle, where the haloed region has a color that is lighter than both the beetle and the background. I do not know what is causing that effect. It would be interesting to see a series of shots with different positions of the light and different f-stop settings of the lens, to see how that light halo tracks those.